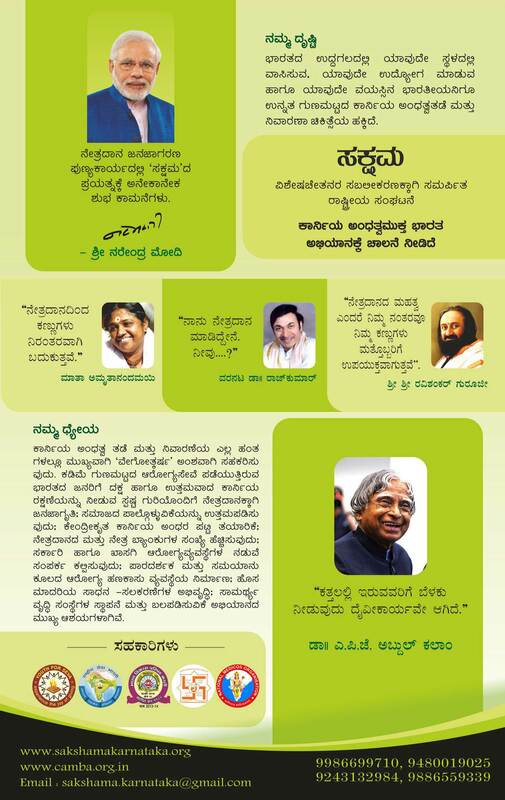 Blindness Free Bharat Movement (in English). The independent India facing many medico-social challenges. Corneal blindness is one among them. Cornea is an outer most transparent layer of eye, which may be damaged due to many reasons like malnutrition, chemical injury, accident, surgery etc. According to one estimation 2 to 20 lakh population of India is having corneal blindness, which can be cured by an eye donation. Unfortunately, there is huge scarcity of cornea in nation. Though every year around 1 crore deaths occur but only 25,000 people are donating their eye for the noble cause. If this number is increased to 4 lakh; Eye banks are established in all states & districts; Cornea specialist are made available at every important place & more importantly the great mass of people is filled with right awareness on eye donation, we can make India corneal blindness free by 2020. To accomplish this national mission, SAKSHAMA has launched a nationwide campaign CAMBA (cornea andatwa mukta bharath abhiyan) on March 5, 2016. The campaign comprises a systematic survey to prepare the data of people with corneal blindness; creating functional network between Donor-Eye bank-Eye hospital-recipient & establishing pool of sight ambassador (Nethra rakshak) to take care of post-operative care & other grass root activities. 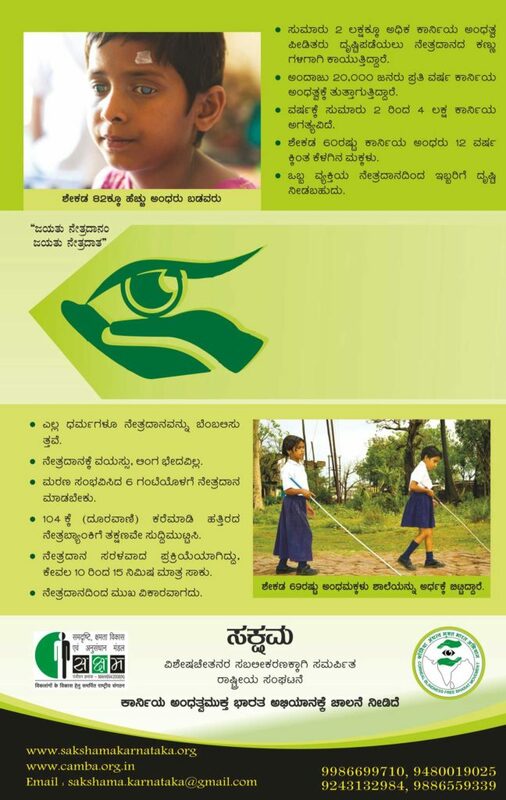 During the national eye donation awareness fortnight (Aug 25 to Sep 8) our volunteers visit homes in Karnataka & educate the public on importance of eye donation. In connection of CAMBA, Saksham organises various activities like Blind-Fold walk,Games, Rally, Human-chine, Bike & Bicycle rally, Presentations in educational institutes, Different competitions in schools, on line campaign in social media etc. Let’s all enlightened citizens of India solemnly pledge our eyes today. Let’s motivate every Indian to become sight ambassador. Let’s be the active partners of the nation-wide campaign for social change & make India corneal blindness free. Want to know more about CAMBA? Would like to pledge your eyes? Nearest eye bank should be informed immediately. Eyes may be removed only by a trained doctor or trained technician. The eye bank team may remove eyes at home of the deceased or at a hospital. Eye removal does not lead to any disfigurement in eye. Only the transparent section of the eyes called cornea is taken out and not the full eye ball. One pair of eyes gives vision to TWO corneal blind people. Eyes donated to The Eye-Bank that are not medically suitable for transplant may be used for treatment, medical research and education. Close the eye lids of the deceased person. Keep cold water cloth or ice cubes on the eye lids to prevent drying out of the cornea. Put off the fan (if running).